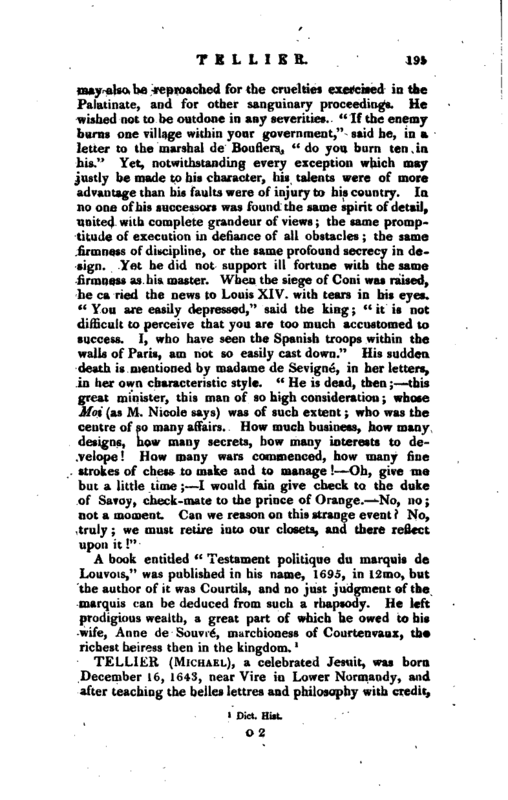 , marquis de Louvois, by which title he is generally known, was born at Paris, January 18, 1641. He was the son of Mit-hel le Teilier, secretary of state, and afterwards chancellor of France, and keeper of the seals. The great credit and power of the father gave an early introduction to the son into the offices of slate, and he was onlv twenty- three when the reversion of the place of war-minister was assigned to him. His vigilance, activity, and application, immediately marked him as a man of superior talents for business; and two years afterwards, in 1666, he succeeded his father as secretary of state. In 1668 he was appointed post-mastergeneral, chancellor of the royal orders, and grand vicar of the orders of St. Lazarus and Mount Carmel; in all which places he fully justified the first conception of his talents. By his advice, and under his care, was built the royal hospital of invalids; and several academies were founded for the education of young men of good families in the military line. After the death of Colbert, in 1683, Louvois was appointed superintendant of buildings, arts, and manufactures. Amidst this variety of occupations, to which his genius proved itself fully equal, he shone most particularly in the direction of military affairs. 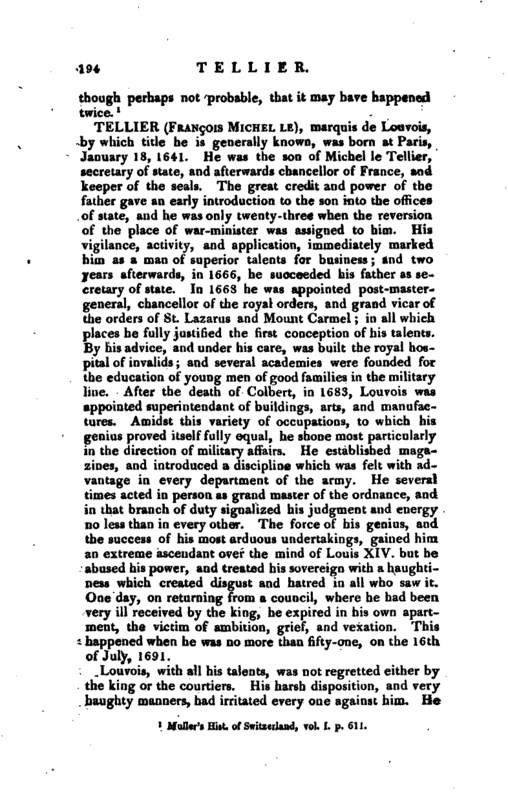 He established magazines, and introduced a discipline which was felt with advantage in every department of the army. He several times acted in person as grand master of the ordnance, and in that branch of duty signalized his judgment and energy no less than in every other. The force of his genius, and the success of his most arduous undertakings, gained him an extreme ascendant over the mind of Louis XIV. but he abused his power, and treated his sovereign with a haughtiness which created disgust and hatred in all who saw it. One day, on returning from a council, where he had been very ill received by the king, he expired in his own apartment, the victim of ambition, grief, and vexation. This happened when he was no more than fifty-one, on the 16th of July, 1691.